Sybilla Irwin, a South-Texas native, is a talented wildlife artist with a fresh approach to this well known genre. 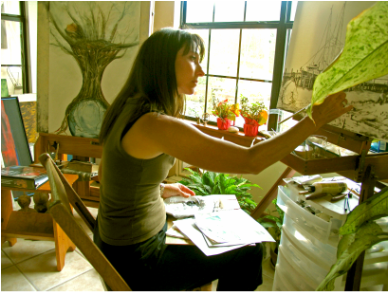 Sybilla works in multiple mediums: watercolor, oils, pastels, and pyrography. Sybilla excels in the mastery of color and attention to detail. She has manifested a God-given talent for creating realistic drawings since the tender age of 6. She found herself in love with horses and fascinated with the beautiful illustrations in her favorite horse stories such as those illustrated by Walter Anderson. Reproducing those illustrations as a child, taught her how to draw, thus beginning her artistic journey. Sybilla draws inspiration for her works from her love of nature and its fine creatures. Her approach is fresh and modern, unlike many artists in this field; her paintings are larger than life with photo-realistic effects, seeming to explode off the page while still maintaining the aura of mystery that surrounds us all. Sybilla has a Bachelor of Arts in Theatre and a minor in Art from Texas A&M University in College Station. Since 1995 she has taught art in various mediums in the community and in the public schools, where she is able to impart her love and understanding of the visual world to hundreds of students. Sybilla has self published several prints of her paintings and is currently illustrating numerous books with several different authors. Sybilla was born in Hondo, Texas. She has three extraordinary children and one grandchild. An investigator for the Bigfoot Field Researchers Organization, Sybilla interviews witnesses and attends expeditions throughout the U.S. She works one-on-one with witnesses to create life-like artwork of their encounter. Her other interests include writing, playing the piano, music and poetry, photography, backpacking, camping, and reading. Subscribe to Sketching Encounters Research Project Click Here! "My first close encounter with those whom I dubbed the Forest Giant People occurred in 1957 in Washington State. I have had multiple encounters since in widely-separated states.This granted me a broad range for anatomical comparisons. Sybilla’s renderings bolster my firm belief that while these Hominids may not be Homo sapiens sapiens, at minimum they are extremely close relatives who deserve our respect and protection. The subtle differences revealed in Sybilla’s excellent works support my opinion." "I have always loved [Sybilla's] work from the limited amount that I had seen linked to sighting reports on the BFRO. The figures in [her] images seem to have a internal, brooding, enigmatic look in their eyes that is both haunting and beautiful. The work on [her] site is wonderful. I followed a link provided by Bossburg on the blue forum. Keep up the great work, [Sybilla]. Anytime your work is included with a sighting report it brings life and a whole new dimension to it."